Boat Storage and Winterization are popular topics at this time of year. If you are a boat owner and have not already done so, now is the time to winterize your boat and to get it into boat storage. Some boaters prefer the no-hassle method of boat storage, and even hire the professionals to winterize the boat before it is stored. It may seem strange, but winter “time off” can be especially hard on your boat. Extended periods of inactivity actually accelerate wear and tear and can contribute to breakdowns next season. Left unchecked, corrosion will spread (remember, rust never sleeps), moisture can intrude and freeze, lubrication can congeal and neglect can take root over the long, cold months. Put another way, if you don’t get your boat ready for storage the “deferred maintenance” of a busy season can come back to haunt you come springtime. The last thing you want to face on that first warm spring day on the water is a broken boat and a hefty repair bill. 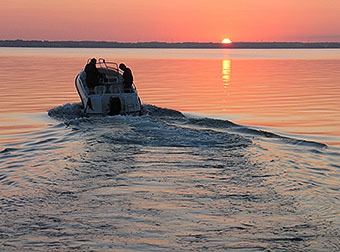 For these reasons, it’s vitally important to get your boat ready for that “long winter’s nap” ! For trouble free boating next spring, check her over from bow to stern. Failure to winterize can cause your boat to suffer significant damage such as cracks that cause leaks, corrosion, frozen pipes, interior damage, and fuel degradation. By the time spring comes all these problems will cost you a fortune to repair, especially since most insurance policies do not cover damage done by neglect or lack of maintenance. Unfortunately, those that do not realize the true importance of winterizing their boats could be in for a rude awakening when they try to use their boats the following spring. They could find a number of problems that could have easily been avoided by a proper winterizing. Before you button her up for the long winter’s nap, winterizing your boat properly, you will maintain your investment year after year. The best place for your boat to be during the winter is out of the water, under cover, in a climate-controlled boat storage area. However, this is not practical in many cases. If your boat will be stored outdoors, a good cover is your first line of defense against the elements. The majority must make do with covering their boats themselves. A top quality, custom-fitted cover is best, with commercially available supports used to prop up the cover to prevent water from pooling in low spots. Park your boat under a protective canopy or in a garage if possible. If this isn’t possible, store it in a location that minimizes exposure to wind, weather, falling leaves and sunlight. Keep the cover clean and free of snow, debris and water — especially after storms — and after checking underneath to make sure everything is OK, tighten everything down. During storage make frequent visits. Most damage done to boats in storage is done by four legged vandals rather than two legged ones. Boats are likely to be damaged by critters during the off season. This is probably due to the fact that they are put away unclean. Carpets, live wells and upholstery hold smells from the many fish that have been landed. They smell like lunch to a hungry raccoon, squirrel or mouse. Many boats are kept in backyards or other locations that are attractive to critters. Once the four legged vandals get on board they find that fabrics used in upholstery, life jackets and seat foam make excellent bedding. Squirrels will use the fiberglass as chewing material which they need to maintain their dental health. They are likely to just set up housekeeping for the winter until evicted by the owner in the spring. What can you do about this? Begin by giving the vessel a thorough cleaning before putting it in storage. You can take it to one of those spray car wash places or give it a pressure wash at home. Take all your gear out and don’t forget to remove the boat plug. Spray the boat inside and out. By the time you get home most of the water will have blown off the boat and the plug can be replaced. Place all gear removed in a warmer dry storage area. The family garage is a good location but so are rental storage places. This includes batteries, trolling motors, PFD’s, emergency gear, outboard motors, removable fuel tanks, etc. This not only protects them from the elements but also from theft. Phew! Preparing your boat for storage is a lot of work, but it’s all part of routine maintenance. Neglect it, and your insurance might not cover any resulting damage. Besides, taking the time to winterize your boat and to store it in a safe location will save you time and money when the summer season starts and you want to get back on the water; when the fish are waiting to be caught! Too often boaters get their rig into the water and find themselves dead in the water after being out for just a few minutes. Don’t be one of them! Be good to your boat and your boat will be good to you for many years to come.